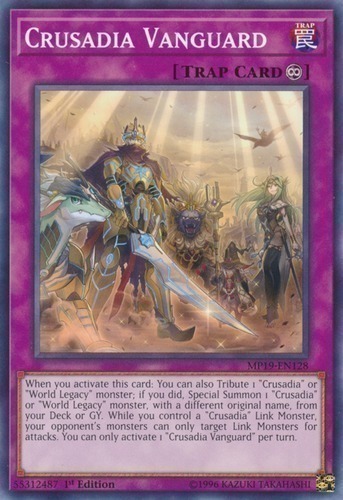 When you activate this card: You can also Tribute 1 "Crusadia" or "World Legacy" monster; if you did, Special Summon 1 "Crusadia" or "World Legacy" monster, with a different original name, from your Deck or GY. While you control a "Crusadia" Link Monster, your opponent's monsters can only target Link Monsters for attacks. You can only activate 1 "Crusadia Vanguard" per turn.